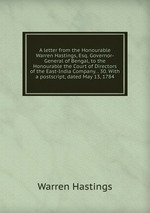 Аннотация к книге "A letter from the Honourable Warren Hastings, Esq. Governor-General of Bengal, to the Honourable the Court of Directors of the East-India Company. . 30. With a postscript, dated May 13, 1784"